An increasing number of grassroot level investors believe that this new age farming technology will allow a complete transformation of the agribusiness. Global environmental changes are expected to provide potential growth prospects to the vertical farming industry over the coming years. Vertical farming is already being practiced in various developing as well as developed nations with the incorporation of hi-tech indoor farming techniques. The exponential growth curve of vertical farming industry can be credited to the expertise of Dutch bioengineers, indoor marijuana growers, NASA, etc. This upgraded farming technology aims to avoid growing crops in inherent disease and draught prone fields that are located away from the masses and need to be transported to the cities. Dickson Despommier, an ecologist at the Columbia University and an active proponent of vertical farming industry since 1999, suggested that future crops should be grown in an indoor, high rise space, in order to reduce the carbon emissions due to vegetable and fruit transportation. As per the estimates, North American countries are experiencing a strong foothold in the industry. The presence of huge corporations eager to exploit the opportunities in vertical farming industry, developed research centers, and a heavy concentration of venture capitalists are some of the factors that are fueling the regional market. These farms are economically viable only for affluent economies owing to the cost of technology involved in the production. However, certain developing nations of the Asia Pacific belt are also increasingly penetrating the vertical farming market. Japan, for instance, is one of the most promising regions that is heavily experimenting with this type of farming. Netherlands, Germany, Scandinavia, and Singapore are some of the other regions contributing toward the growth of vertical farming market. Since the past decade, hydroponic technology based vertical farming industry has begun to gain a huge popularity. The steep population curve, especially in urban areas has catalyzed the trend of growing crops near consumers. Millions of urban farmers worldwide providing fresh agricultural produce to city retail stores are showcasing how food security can be achieved by this high-rise indoor farming technique. The combination of growing urban population interested in fresh crop produce and shrinking rural population is putting a stress on the need of increasing the per capita food production. The economics of greenhouse food production will continue to be one of the prime factors thriving the overall vertical farming industry expansion. Studies showed that hydroponic technologies can increase the food production almost tenfold of the current production, which is why there has been a noticeable surge in hydroponic technology. Hydroponic market size covered 50% of the overall vertical farming industry in 2016. The fact that greenhouse/hydroponic technology does not need agricultural land and still significantly increases the farm productivity sheds a positive light on the national ecological footprints, the consequence of which is also on the rising profit margin of regional vertical farming market that results from agricultural exports. Aeroponics technology is actually a subgroup of hydroponics, except for the fact that this technology based vertical farming does not use any growing medium. It only involves growing plants in a mist rich nutrient environment. In a comparatively shorter span, aeroponics farming has gained phenomenal global attention. There are several grounds on which aeroponic vertical farming market is outpacing hydroponic farming. The prime among them is the ability of this technology to reduce the involvement of water, fertilizers, and pesticides in the farming process by 98%, 60%, and 100% respectively. Several studies and research activities have also shown that aeroponic system allows the plants to imbibe more minerals and vitamins, thereby making them potentially more nutritious. Fertilizer cost is another crucial ground that is favoring aeroponics farming growth curve. The fertilizers that are being supplied as plant nutrients in this system are comparatively less expensive than those used in hydroponics, which is undoubtedly offering a lucrative business opportunity to aeroponics vertical farming market. With NASA’s research support in the upgradation of the technology, aeroponics market growth chart is set to strike high in the coming years. Aquaponics technology is the integration of hydroponics and recirculating aquaculture in one production system. It dates back to 1970, as an idea given by the Recirculating Aquaculture Research community. These techniques have established their place in intensive sustainable agricultural methods. This soil-less crop production method actually uses fish waste as a plant fertilizer. This advanced technology based vertical farming market offers collaborative methods of vegetables and fish production in areas or locations where soil based agriculture is almost impossible. The sustainability offered by aquaponics includes environmental, social, as well as economic benefits. USDA NOP has allowed some of the certification agencies to honor organic certification to hydroponic farming if they are proven to use organic inputs in their operation. National certification agencies like California Certified Organic Farmers (CCOF) have already labeled hydroponic operations as organic. Since soil is not being used in the procedure, vertical farming market is expected to find a difficulty in meeting the strict definition of organic agriculture. The debate discussion over whether these high-rise harvests are organic or not is likely to continue for few more years. 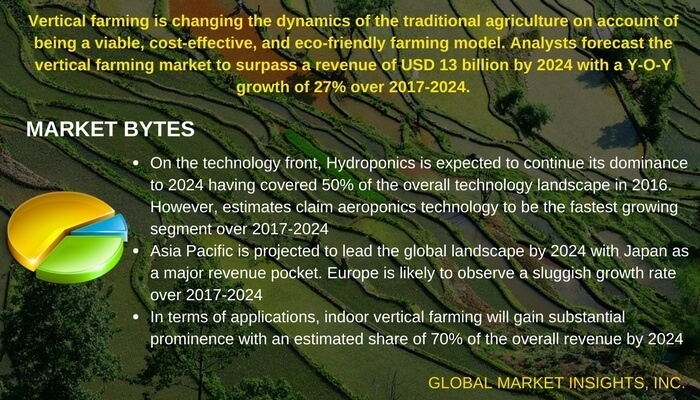 However, despite these restraints, research activities across the world are bringing several variations and new innovations in the techniques which are expected to increase the profit margin of vertical farming industry in future. Global Market Insights, Inc. has a report titled “Vertical Farming Market Size By Product (Equipment [Lighting Systems, Pumps & Irrigation Systems, Tanks, Sensors, Pipes, Climate Controllers, Meters & Solutions], Fruits, Vegetables & Herbs [Tomato, Lettuce, Bell & Chili Peppers, Strawberry, Cucumber, Leafy Greens], Aquatic Species [Tilapia, Bass, Trout, Salmon, Crab]), By Technology (Hydroponics, Aeroponics, Aquaponics), By Application (Indoor, Outdoor), Industry Analysis Report, Regional Outlook (U.S., Canada, Germany, UK, Netherlands, Belgium China, India, Japan, South Korea, Mexico, Brazil, Argentina, South Africa, GCC), Growth Potential, Price Trends, Competitive Market Share & Forecast, 2017–2024” available at https://www.gminsights.com/industry-analysis/vertical-farming-market .